Varun Dhawan Or Karan Johar, Who Captioned This Million-Dollar Pic Better? 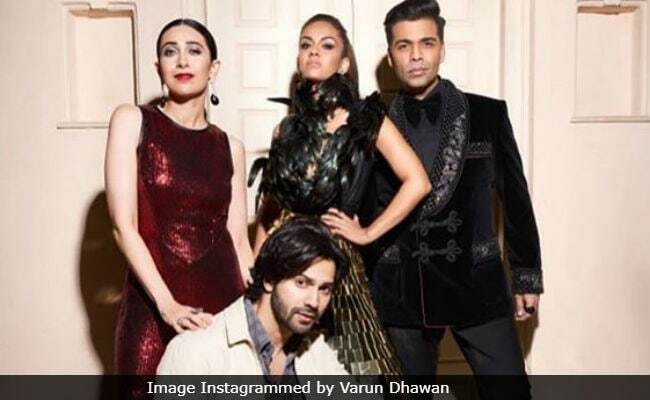 Actor Varun Dhawan delighted his fans by sharing a stunning picture of himself along with filmmaker Karan Johar, Karisma Kapoor and Natasha Poonawlla on his Instagram profile on Tuesday. He accompanied the post with a hilarious caption and wrote: "When class met mass, the result is jhakaas." In his caption, Varun revealed that the actual reason behind sharing the picture was to "troll" Karisma, KJo and Natasha Poonawalla. However, much to Varun's surprise, the picture turned out to be perfect. Varun added, "I totally took this picture to troll them but they honestly look beautiful and I just love my hair." If you thought that Varun's caption on the post was interesting, wait till you read KJo's description. In his post, the filmmaker referred to himself, Karisma and Natasha Poonwalla as "posers" and Varun Dhawan as the "swag wala boy" and wrote: "The posers and the swag wala boy who didn't read the dress code." Later, Karisma Kapoor also shared the picture on her Instagram profile. In the photograph, which appears to be from a photo shoot, Karimsa Kapoor can be seen dressed in a shimmery maroon gown, while Natasha Poonawalla can be seen wearing an embellished black and gold outfit. No points for guessing, KJo picked an all-black outfit and "swag wala boy" Varun Dhawan (as described by KJo), can be seen striking a pose in a semi-formal outfit. Karisma Kapoor and Karan Johar have been making frequent appearances on Varun Dhawan's Instagram profile recently. On Monday, the Badlapur actor shared a picture of Karisma posing with his father David Dhawan and wrote: "He's so happy." Over the weekend, Varun shared a hilarious video, in which the actor could be seen offering a piece of chip to KJo during a flight. Varun Dhawan made his Bollywood debut with the 2012 film Student Of The Year , which was produced by Karan Johar's Dharma Productions. On the work front, Varun was last seen in Sui Dhaaga, co-starring Anushka Sharma. Varun's next film is Kalank, co-starring Alia Bhatt and Aditya Roy Kapur. Varun Dhawan or Karan Johar, whose caption did you like better, tell us in the comments section.